On 26 January 1926, Baird invited 40 members of the Royal Institution to his workshop above 22 Frith Street, London, to watch him demonstrate the live transmission of an image of a moving face “by radio”. For all the experiments in the early 1920s with moving silhouettes transmitted by wireless, notably by American inventor Charles Francis Jenkins as well as Baird himself, the 22 Frith Street event is regarded as the world’s first public demonstration of television. 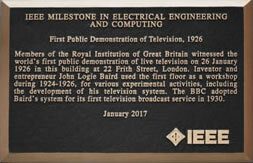 On the afternoon of 26 January 2017 – exactly 91 years to the day since Baird demonstrated his mechanical apparatus to his Royal Institution guests – volunteers from IEEE gathered at 22 Frith Street for a ceremony to unveil a bronze street plaque dedicated to the invention of television. IEEE funds a history programme called Milestones, which commemorates significant advances in engineering and technology. Before this week, a mere dozen IEEE Milestone plaques had been dedicated in Britain, including those for such key technical inventions as the invention of public key cryptography at GCHQ (1969-75), Benjamin Franklin’s work with electricity during his intermittent periods of residence in London (1757-75), and Alan Dower Blumlein’s invention of stereo sound recording (1931). This last-named Milestone plaque is mounted at the front door of Abbey Road Studios. The plaque at Frith Street has become the 13th on these shores. In attendance at the unveiling were a small gathering of IEEE members and officers, several of whom had flown across the world for the ceremony. Unveiled by Baird’s grandson Iain and IEEE president Karen Bartleson, the plaque joins two existing memorials already at the site: a classic blue English heritage plaque commemorating the same event, and one indoors acknowledging the first British transmission of HD television. 22 Frith Street is the location of Bar-Italia and Little Italy run by the Podrelli family who hosted a party of IEEE officials prior to the unveiling; IEEE would like to extend thanks for their hospitality. on Friday 27th January 2017 the Royal Institution of Great Britain hosted over 150 specially invited guests to celebrate the evolution of television from Baird to the digital age. Speakers included IEEE President Karen Barleson, Region 8 Director Margaretha Erikson, President of IEEE Broadcast Technology Society and IEEE UK and Ireland Section Chair, Ali Hessami. Donald McLean, author of the award-winning book ‘Restoring Baird’s Image’ explained how a poor inventor could achieve such an amazing string of ‘firsts’, ahead of any established corporation, commencing with the world’s first demonstration of what he called ‘true’ television in January 1926. 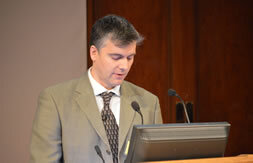 Iain Logie Baird, spoke about John Logie Baird, the person. He summarised his grandfather’s childhood, growing up in Helensburgh, with a fascination with science fact accompanied by a strong influence of the science fiction of HG Wells before University life in Glasgow and a brief ‘conventional’ working life as a young electrical engineer at the Clyde Valley Power Company. Iain described some of John Logie Baird’s successes and failures with his earlier inventions and businesses, including artificial diamonds, the Baird Undersock, a jam-making business in Trinidad, a soap business in London and inflatable insoles for shoes! But it was during his time in Hastings that he had his ‘eureka’ moment when he first envisaged a method for ‘seeing by wireless’, which pre-empted his move back up to London and a new laboratory in the attic rooms of 22 Frith Street. 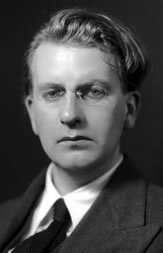 John Logie Baird is seen by the British public as having achieved more in establishing British television than any other individual. In the course of just a few years, from 1926 to 1932, his achievements in ‘first’ demonstrations of television’s possibilities and his own experimental television service confirmed him in the public’s view as the pre-eminent pioneer of television in the UK, making him a legend in his own lifetime. His enthusiastic support for, and demonstration of, television’s promise accelerated the introduction of television in the UK, yet he would play no part in his company’s competition with Marconi-EMI for the BBC Television Service of 1936. Sidelined as the primary decision-maker after a takeover of his company by directors of Gaumont-British, from 1933 his primary focus shifted to television projection systems for cinemas. Then, during the war, he showed yet again hat an individual with vision could achieve when he developed and demonstrated closed-circuit 600-line colour television, funded out of his own savings. Some considered him, at the time, a charlatan whilst others believed him to be a genius, all of which has polarised professional opinion in the decades since.